Diana Worthing has had quite enough of heroes, thank you. She’s the daughter of a naval hero and married to one, and she knows exactly what heroes are about. So when James Ardmore, gentleman pirate hunter and thorn in the side of the British navy, abducts her from a tedious house party and spirits her off to his ship, she finds it a welcome relief. 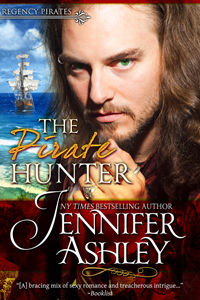 James Ardmore is convinced that the island of Haven, owned by Diana’s father, holds the secret to the pirate he’s been hunting for years. His need for vengeance is strong, but he doesn’t expect that when he interrogates Diana about the island’s location, the sparks between them will be scorching, tempting him to abandon his quest and spirit away this beautiful, intriguing woman who matches him in fire and determination. He can’t bend the beautiful Lady Worthing to his will, but fate intervenes and strands him on Haven one year later, where he finds Diana now a widow and as fiery as ever. The secrets of Haven are vast, and Diana must prevent James from unraveling them and destroying her refuge from the world. But even more, she must prevent her fascination with him from destroying herself.